Ambition and drive aren’t the only way to get things done. 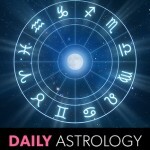 Today’s Sun/Saturn square shows that fear of failure can be a motivator too. Sometimes it’s disappointment and not satisfaction that gets you to grow as a person. That offer isn’t everything you want but it’s what you need right now. You’re on the brink of a breakthrough when Jupiter turns retrograde. Will this leave you hanging? Not if you pull out an oar and paddle your own canoe. Are you out of your depth or do you need to dig deeper? Dig deeper. You’re more capable than you know. The only person keeping you from being you is you. Remove all the expectations, demands, and reprimands and you’ll see you’re not half bad. Insult often gets added to injury when the Sun squares Saturn. You’re clear on how you want to handle the situation. Stay true to that. Jupiter retrograde could lead you to abandon the path you’re on, but hopefully you have more confidence than that. Your faith will be rewarded in Aug.
Resistance isn’t always good. Step out from behind that entrenched position and take another look at the situation. Self-criticism is like closing the gate after the horse has gone. It’s better to learn from your mistakes than to rake yourself over the coals. You don’t like being pushed and now that Jupiter’s retrograde, you won’t be. How much progress will you make on your own? You’ll find out in Aug.